Here's a quick give away for you. I went to The Machine Quilter's Expo last week with my two good friends Tina and Sarah. Go visit Tina's blog...she has pictures of the beautiful quilt she entered! We also met two new friends Diane and Linda...Hi ladies!!! I hope we can all meet up again next year too (cheesecake first instead of the salads though). 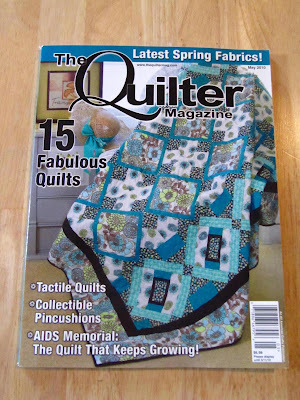 I'll have a separate post on the show later, but in our tote bags for taking a class was a new copy of "The Quilter Magazine" for May 2010. Great magazine! Well, I went back up to the show for the third time that week with my husband to pick up a little purchase (another post too). As we were walking out, the gave me another copy of the magazine, because it was the last day of the show. If you would like to have this extra magazine, just leave a quick howdy doo and I'll pick a winner tomorrow. It's a quick one to get the magazine to you this week! Looks like a great prize. I'd like to add my name to the drawing. Thanks. I am glad you had a great time. Tina's "Math Geeks Unite" is very pretty. Can't wait to read about your purchases. Can't wait to see what you picked up at the show. I'd love to win your magazine. I wish i could have gone! Add me please! Please add me to the list of names for the giveaway. I'd love a new magazine... so many new ideas! I'd love to have the magazine. Can't wait to see pictures from the show. I always love visiting your blog, such great ideas and inspiration. Hi Karen, I love your blog - especially TTT. Such an original idea. I'd love to be entered in your giveaway. Keep up the good work! Thanks so much for the offer! I would love to sign up! I'd love to be entered Karen. I used to take this magazine by subscription, but have let it run out. There are usually some very pretty quilts. Thanks so much! I'm looking forward to the pictures. I'd love to have that magazine, those colors just pop out at ya on there! Thanks for a chance, it would be lovely to win this magazine. or should I say "G'day!"? Howdie dooody!...to you too! don't have this magazine so would you please throw my name into the hat!! Thanks, Karen! I would love the chance to win the magazine. Here's a quick howdy-do to you, Karen. Hope all is well up in your neck of the woods! Sounds lke you had a fun time. I'd love to be included. Oh how nice! So here's a howdy doo to you Karen! I've never seen a copy of that magazine, so, of course, I'd love to win it. Can't wait to see your post about the show, too. I would certainly love to have the magazine, if you don´t mind mailing it abroad!! If not, it´s ok, you are very generous. Thanks. I wait to see the pictures from the festival. I would love this mag. I read them all cover to cover until they are worn out and then read them again combining the ideas into something entirely different. I can't wait to see the photos, wish I had gone, but too much temptation;) Today is the NK one at the school, so hopefully I have enough time to enjoy it. Love the quilt on the cover of that magazine! So pretty! Hopefully you'll pull my name. Haven't had a new magazine to read for awhile. Love your blog. jo from MN, West Side of Straight. Thanks for passing on the extra copy of a magazine to someone. I would love to win it.I don't subscribe to any magazines so this would be a treat! Can't wait to see the quilt show pictures. I love your tool time Tuesday posts. Such good ideas. I am so jealous that you got to go to the show. I received a complimentary admission ticket and was planning to go when life got in the way. I hope to get there next year. I would love to hear more about your impressions of the show and the classes you took. It's great to meet up with friends. Sounds like you had a great time. I subscribe to a couple of quilt magazines, but I haven't seen this one before. Please enter me in your giveaway. Wow, how sweet of you to share your extra copy. Thank you! Stick my name in for the magazine. Looking forward to the pictures from the show. I'm new to reading your blog but love all the things that you share. Thank you and I would love to have a try for the magazine. You are so generous with all you tool tips and now a give away. I look forward to your posts every week. Thanks for all you do. I have heard nothing but good things about the Machine Quilter's Expo and would like to go one day...Can't wait to read about it. I would love to win the magazine, as it is one of my favorite's and I have had to let the subscription go for budget reasons. what fun- you are very generous! The magazine looks great. Thanks so much for giving it away! Tina's quilt looks great. Sounds like so much fun...especially the cheesecake part. Oh, I love the quilt on the cover. Could you add me to the long list of entries. PS: Thank you for tool time Tuesdays. I am inspired by your resourcefulness and out of the box thinking. Absolutely Cheesecake first. Sounds like you had allot of fun. I agree dessert first. I would love to win the magazine. Thanks for the chance. I would love a chance to win this magazine. I'd love to have a copy of the magazine. Sounds like you had a fun time. Howdy doo & aloha! Love quilting magazines! Lucky you and how very generous. I'd love to win a copy of this magazine. Quilt magazines offer such inspiration and I'm always looking for new ideas and inspiration. The cover of this one looks great too! Hi Karen! I follow your blog daily, although I don't have one of my own. I took a class at MQX last Monday but didn't get a tote bag because I did the one day class sign up. I didn't even get to see the show! Wish I had had more time but my firend and I helped pack up some of those totes and the magazine looked great! What a nice giveaway. Love the quilt on the cover. I`d like to win the magazine.Thanks for the opportunity. The Quilt magazine is nice, but I want to win your sewing room! Mine stays too cluttered and while I'm sewing I always feel a teeny bit guilty that I'm having fun and not cleaning up! Too sweet! Throw my name in the hat, too. I have two giveaways going on myself, a Christian book at http://shawneett.blogspot.com, and pinup-style headbands at http://flirtyapronswap.blogspot.com! Add my name to the drawing. Love the quilt on the front page. Thanks. I can't wait to hear all about the show. Thanks for the chance to win the magazine! Yes, please. You can send it to me!! Howdy. Thanks for the opportunity. I would love to have this extra. Thanks for the chance! 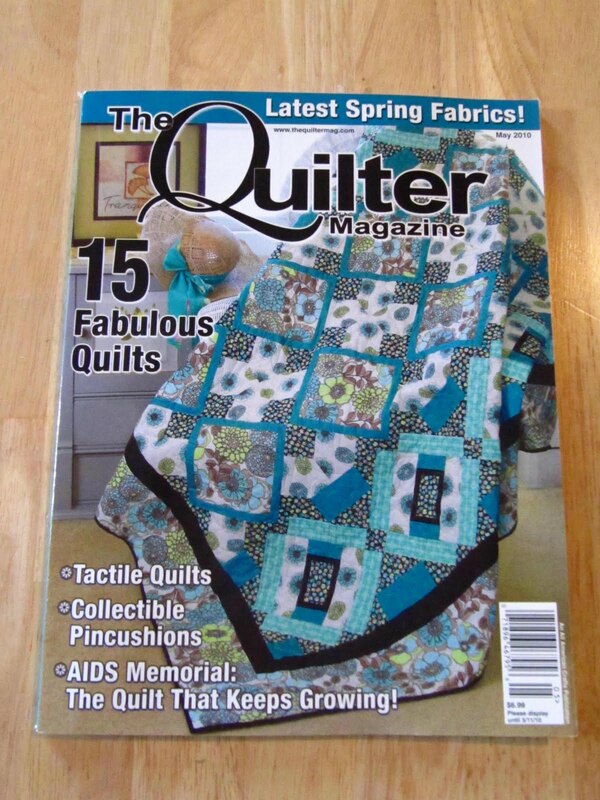 I quite like The quilter magazine and have not bought one for awhile. How nice of you to share it. Thanks for the chance to win it. One can never have too many magazines, I say! Thanks for the chance! I enjoy visiting your blog and love your TTT. Please add me to your giveaway draw. Thanks and have a Great Sunday!!!! I would love to have the magazine--beautiful quilt on the cover. Thanks for the drawing on it. I've not seen this magazine and would love to peruse its contents if I am picked. Thank you for your generosity. Would enjoy receiving this one from you. Envious you were there! Looks like a great mag, thanks for the giveaway! Hope I'm not too late!!! Our group always checks with you to see what is new. You HAVE to pick me, of course, 'cause I truly am your biggest fan!! Please, I just NEED you to pick me, well, us. thanks so much for being you and all you do! How sweet of you to pass one along. Love you blog, so glad I found you... I live on an island w/no bridges to the mainland, stores, mail, nothing! well, we do have the Atlantic ocean and miles of beaches with nothing but wild horses! lol I just began blogging, so glad to find ladies like you who inspire. Howdie, just address the package to me. LOL Thanks for the chance, so generous of you. Hope I'm not too late to enter, I would love to win this magazine! If I'm not too late, I would like the magazine. I am not familiar with that particular one, and would enjoy looking at it. hope I am not too late, love the fact that it has pincushions in it. Looks like an interesting magazine. I haven't read it before. The magazine looks scrumptious!!! I would love to devour it! I've never read that magazine before - thanks for the giveaway!